Secure your chances of achieving those coveted international licenses by getting our MOST IN DEMAND review bundle: ALL IN LIVE ONLINE TRI-PHASIC PROGRAM! A bundle of all our review programs (Worldwide Comprehensive Webinar PLUS E-learning 1-on-1 PLUS 15-day intensive webinar). Maximize your chances by getting ALL the advantages! 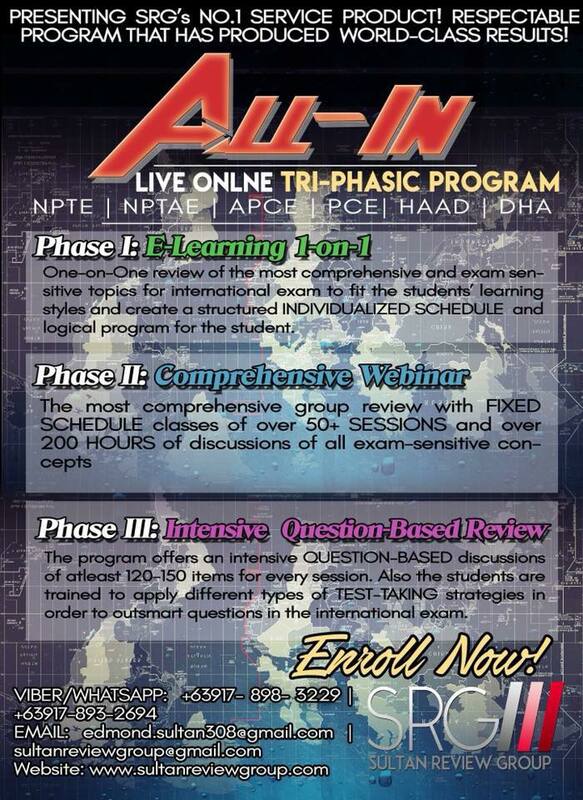 Carefully tailored for you to hurdle the international exams- the NPTE, NPTAE, PCE, APCE, DHA & HAAD Licensure Exam! This is the most COMPREHENSIVE, INTENSIVE and INDIVIDUALIZED online review program designed to help you be the licensed PT you have been aiming to be!